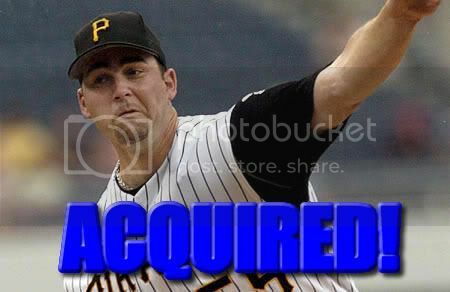 As you surely know by now, the Royals today took their first step toward building a new starting rotation by shipping young reliever Jonah Bayliss (RC's #19 prospect) and a player to be named later (PTBNL) to the Pittsburgh Pirates for veteran starter Mark Redman. Redman, who turns 32 next month, exercised his $4.5 million option in November, but according to Cot's Baseball Contracts Page, $1 million of that is being picked up by the Oakland A's. No financial terms of the deal were disclosed, but even if the Royals receive no cash from the Pirates, $3.5 million is very palatable. So what does RC think about this trade? We like it quite a bit. The Royals will not miss Bayliss, and the PTBNL is merely a formality (although we'll be curious to see who the Royals ultimately send to complete the trade). Redman is a fierce competitor who promises to eat some innings at a roughly league average clip. Make no mistake...Redman is NOT a great pitcher. You might be pushing it to even call him a good pitcher, but the fact is that right now, the Royals needed someone they can count on to deliver some decent innings. And over the last four years, Redman has averaged 30 starts and about 190 innings per season, while keeping his career ERA at a perfectly average 4.47. If Redman gets off to a good start -- as he did last season -- the Royals may even be able to turn him into a prospect who is considerably more valuable than Bayliss before the trade deadline. If not, then they've spent only $3.5 million (or less) on a roughly league average pitcher during a time in which the market is fully willing to pay a pitcher of similar ability over twice that. Indeed, this was a quality trade, and we're looking forward to seeing what tomorrow brings. We have a feeling Allard isn't done dealing. Like the page, but could you please spell our new pitchers name right? Holy crap! You're right. I didn't even notice. The change will be made immediately.